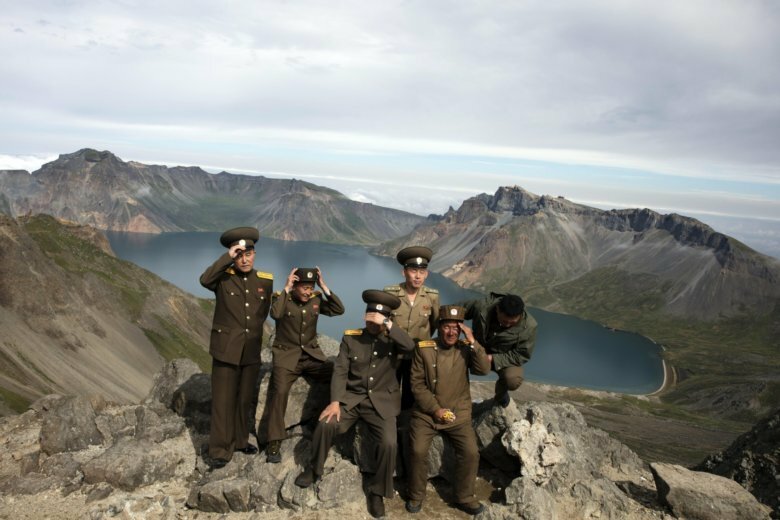 It was from the dense forests around Paektu that national founder Kim Il Sung’s guerrilla resistance battled the Japanese colonial forces that governed the entire Korean Peninsula until their country’s defeat ended World War II in 1945. As every North Korean schoolchild could tell you, it is riddled with “secret campsites” where Kim’s supporters fought for Korean independence and honed the revolutionary spirit that would eventually enable them to rise to power after the Japanese were forced out and their own nation split in two as the United States and Soviet Union tried to assert yet another foreign political agenda on the Korean people. Images of Paektu are everywhere in the North. Kim Jong Un has made Paektu, which straddles the border with China, something of a pet project. He has visited the mountain several times and has ordered the closest city, Samjiyon, rebuilt into a showcase of the socialist revolution. The Associated Press was allowed to see the city last month as Kim was making an inspection tour. The scene was almost Biblical in its scale — tens of thousands of “soldier-builders” in olive-colored uniforms and yellow hardhats had been mobilized to essentially build the new, model city up from the ground. Workers and students joined them, digging ditches, flattening the surfaces of new roads. A similar, but smaller-scale scene was taking place simultaneously on the mountain itself. On a face of the mountain visible just beyond the area where visitors view Paektu’s crater lake, workers were putting the final touches on the lettering of a slogan in praise of the Kim family. On Thursday, Moon was almost sure to see that slogan — “Mount Paektu is the Sacred Soul of the Revolution,” with the signature of Kim Il Sung — freshly painted in white. In North Korea, everything is political. Even the mountains.